They’ll only be producing 1,964 of these limited edition 2015 Anniversary Mustangs, but if you get your hands on one it’s guaranteed to be a collector’s edition, and come fully loaded (image gallery below). By now you should have caught wind of a strong rumor floating around that Ford is indeed planning to build a 2014 1/2 Mustang, or possibly caught a glimpse of the recent spy photos of the vehicle in testing mode. 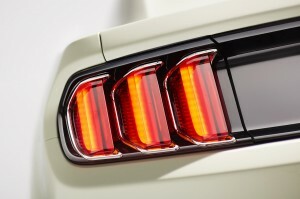 Today, Ford has confirmed this to the public (they are calling it a “2015 Mustang,” despite the 2014.5 advocates out there) and provided a list of things you can expect from this limited edition run of 50th Anniversary Mustangs. Ford has been using the Mustang’s 50th anniversary as the perfect excuse to put on display the grand legacy that the Mustang has built for itself over the last 50 years, and so far they’ve yet to miss a beat. We’ve been taken back in history and shown what impact the Ford Mustang has had on not only the automotive industry, but also the car’s role in shaping American culture for the last half century. Is it a 2014.5 Mustang or 2015 Special Edition? While Ford is referring to this car as a 2015 model year “50th Edition,” it seems they’re following a similar, albeit confusing way of classifying these cars. All of the original 1964.5 Mustangs had 1965 model year (MY) VIN numbers, much like the 50th Mustangs will have 2015 MY VINs. That has led Ford to refer to the 1964.5 Mustangs as 1965 cars and subsequently, the 50th Mustangs will simply be limited edition 2015 models and not–officially–2014.5 cars. However, it’s not a matter of pure, unintended irony that they’re only producing 1964 of the Limited Edition 2015s and you can be sure it’s caveats like this that will fuel the “2014.5 Mustang” denotation. It is also subtle hints like this that will keep the enthusiast crowd referring to the original cars as 1964.5 and the newest Anniversary cars as 2014.5 Mustangs, even if the vin number says otherwise. Much of the unique details and exclusive parts on the limited edition run of 2015 Mustangs have been pieces transplanted from the original 1964 1/2 cars. The Wimbledon white paint job is a tribute to Capt. Stanley Tucker’s 1964.5 Wimbledon While Mustang–the very first Mustang ever produced(serial number 0001). The chrome accents on the Anniversary Mustangs are there to remind us of the days when chrome played a prominent role in many production vehicles–the Mustang included. Even down to the Y-spoke wheels and faux gas cap, every angle you look you’ll spot a classically inspired design, exclusive to this limited run. What details are we still missing? Besides the power and weight specs, the pricing for the 50th Anniversary Mustang has not yet been divulged, but you can bet on them costing more that you would pay for a standard 2015 GT Performance Pack. 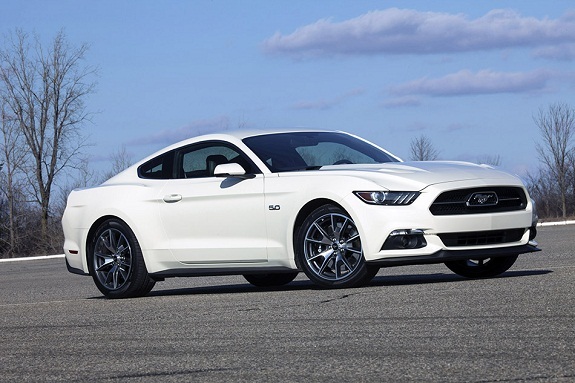 When will the first 2015 Mustangs be delivered? Ford is saying that the limited edition 50th Anniversary Mustangs will be available in the fall. They’re also saying they are to be among the first 2015 Mustangs produced, leading one to believe delivery on the standard 2015 Mustangs won’t be until later in the fall as well. For a complete list of photos, head over to Mustang6G’s image gallery. Love it, love it, love it…. Awww what happened to the front?! Feels like two different designers went at it. As nice as it is I could only purchase it as a collector Item. 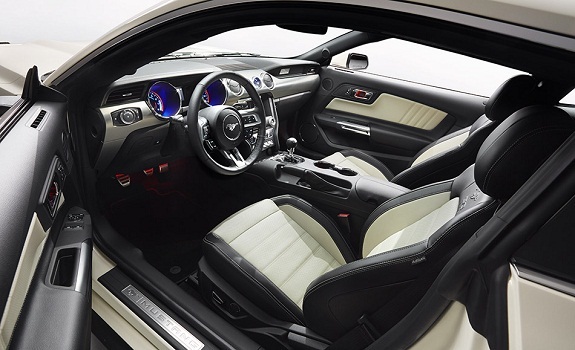 I could never live with the color of the interior. I wish they would tell us the power figures already. “more than” 420hp… Yeah, we get it, but HOW MUCH MORE?! It’s obviously NOT a 2014 1/2 Mustang. They haven’t even started building them yet. The reason enthusiast call the ‘early’ 1965 Mustang a 64 1/2 is because they came out so early in the year. The 2015 won’t be out until September. its a nice looking car …but it’s not a mustang…. I have one now and its BaddAss I have made a couple of changes and now sit with about 470 HP.